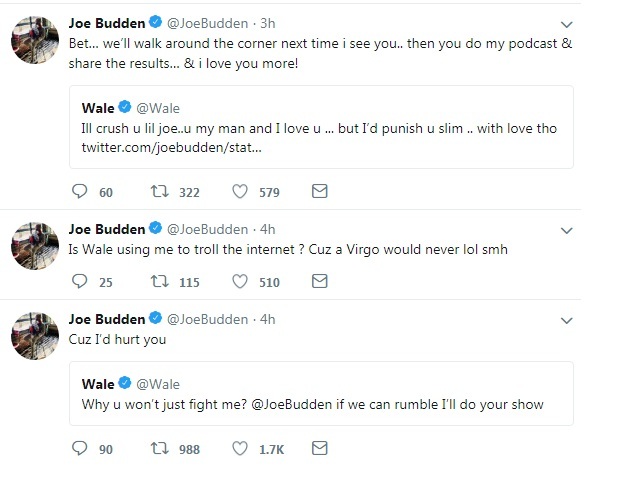 Wale Wants To Shoot The Fade With Joe Budden To Do His Show! Wale makes it clear: "I want to fight Joe Budden." I don’t know, guys. Both of these men are talented in their own special way. And yet, they want to fight. Do media. Do songs. Fight? We have HBO and Showtime for that. They are both 30 and up. I guess there is some residual grime from when Wale was on Joe’s previous show? I don’t know, but this is just odd. Wale is out there in the music industry ocean with no paddle and Joe’s new show is not “Everyday Struggle.” Maybe they need each other. Amazingly, right after I put this up, the Internet Nation comes through and screen grabbed Joe's part.